Part of a museum complex designed by Bernard Tschumi Architects, a new interpretive center on the site of the historic Battle of Alésia will open in a formal ceremony on March 23, 2012. Located in Burgundy the building marks the position of the Roman army, under Julius Caesar, and its encampment surrounding the Gauls under Vercingetorix in 52 B.C. The building is articulated in three layers, with a base, a middle zone, and a top. The base hovers over the excavation site on more than 100 slender concrete pillars, which have been individually positioned with the help of experts so as not to disturb the delicate remnants. This level contains the main entrance lobby and temporary exhibition spaces, as well as openings and glass floors looking onto archaeological excavations. 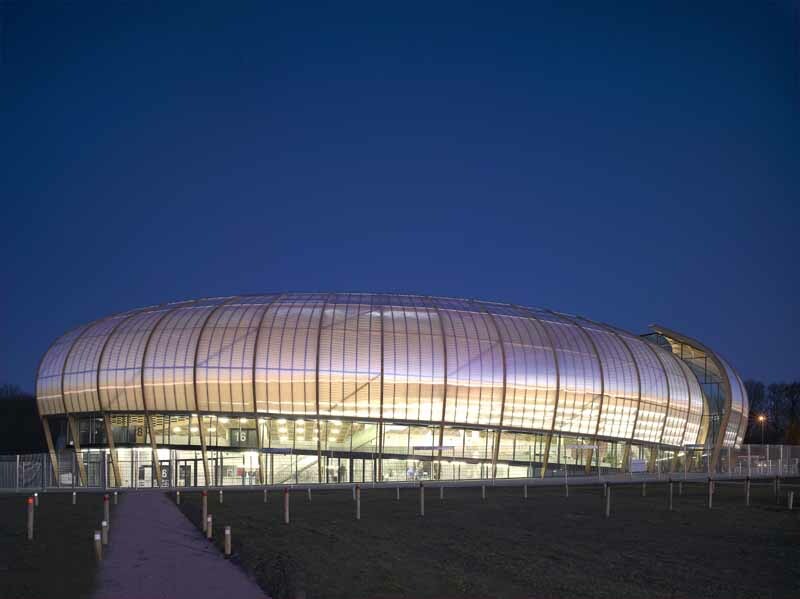 The design by Tschumi for the project incorporates two distinct acoustical envelopes: an outer polycarbonate skin that filters light and defines the circulation spaces and an inner wooden envelope that provides an intimate setting for concerts and events. This concept responds to the dramatic site, a clearing in a large forest at the edge of the city, surrounded by trees more than 200 years old. The Athletic Center at the University of Cincinnati can be described as both a freestanding infill, and as a contextual free-form. Its unusual boomerang-or link pin-exterior shape has been designed to maximize its tight site constraints, which results in dynamic residual spaces between its curvilinear shape. Vilette Park: architecture competition held in 1992 for a park on the site of national meat market & slaughterhouse. January 30, 2016 in Architects.